Edison was, without a doubt, one of the most productive inventors of all time. He was awarded 2,332 patents—the third most of any American—including many that continue to affect our lives today: the electric generator, electric pen, fuel cell, storage battery, and motion pictures. Edison’s success didn’t spring from a single moment of inspiration—rather, it was the result of a deliberate approach to changing the world. 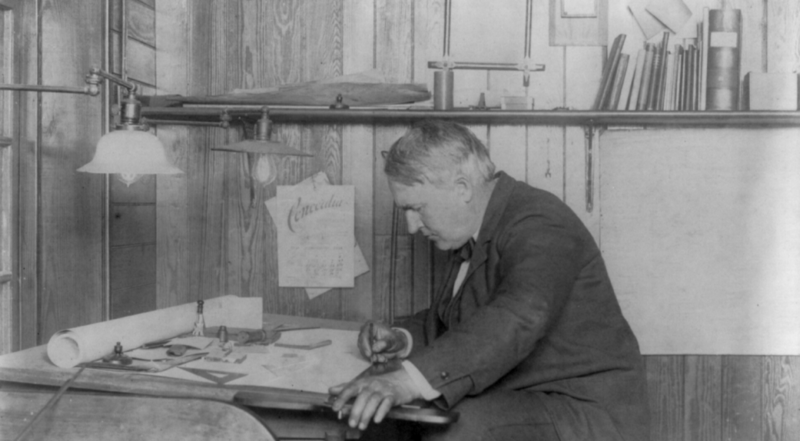 Throughout Edison’s life, journaling was a consistent practice, capturing not only the his inventions but also his mind at work. He wrote 3,500-plus journals containing more than 5 million pages of notes. As a longtime journal keeper, I pored through Edison’s journaling process to see what I could learn. Here are four lessons I learned from studying Edison’s journals that can help you reach your goals. Edison was a man of his word when it came to work ethic. He aimed for one minor invention every 10 days and a major invention every six months. Edison achieved this through a massive emphasis on output over success rates. For example, he performed 50,000 experiments to invent the alkaline storage cell and 10,000 to perfect the light bulb. There’s a tendency to create a mythology around the work ethic of famous people, so I wanted to note where Edison managed to balance hard work with quality leisure time. Edison and his lab employees eased the tension of stressful work sessions with sing-alongs, dances, poetry contests, midnight snack parties, playful musings, and a pipe organ. Higher output leads to higher success rates. Many people optimize to avoid failure, but by optimizing for total output, Edison was able to produce an incredible number of meaningful inventions. Balance work with quality leisure time. Nobody works all the time, so it’s important to keep your life in balance. Keep a to-do list. Observing that Edison kept a long to-do list motivated me to more actively journal my tasks to be done. While making 10,000 mistakes with the light bulb and 50,000 with the alkaline battery, Edison also made it a priority to extract lessons from each of those 60,000 attempts so he could get closer to what could work. For Edison, there were no failures, only lessons learned. Edison contended that there was value in making mistakes if you learned from them. Compare this to grade-focused educational institutions, which encourage avoiding failure at all cost. In school, students are rarely given second attempts. Always count a lesson learned as a success. Reflect on why you failed at something — going to the gym, writing, eating healthy — and then use that knowledge to try again. Failing forward toward your goal is a powerful skill. Fail fast to get to the win. One could argue that we would not know about Edison if he didn’t fail fast enough — or gave up — in his attempt to invent the things we enjoy today. This lessons-learned approach helps explain the value Edison placed on his high-output approach to work. The more experiments Edison ran, the faster he learned, and the sooner he reached his invention. Edison’s journals go beyond tracking and reflection. They also were a place for examining the processes of his mind. 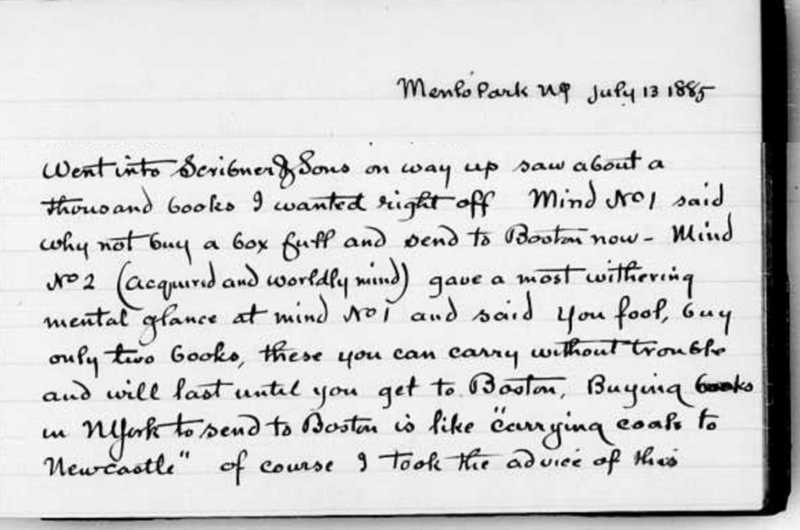 Menlo Park NJ July 13 1885…Went into Scribner & Sons on way up, saw about a thousand books I wanted right off. Mind No 1 said why not buy a box full and send to Boston now. Mind No 2 (acquired and worldly mind) gave a most withering mental glance at mind No 1 and said You fool, buy only two books, these you can carry without trouble and will last until you get to Boston. Buying books in NYork to send to Boston is like “carrying coals to Newcastle.” Of course I took the advice of this earthly adviser. In 2011, Daniel Kahneman introduced us to the concept of two minds in his book Thinking, Fast and Slow. One mind is slow, effortful, and rational. The other is quick, emotional, and not at all rational. A century and a half before Kahneman’s book, Edison was using his journal to catch his emotional mind and override it with his rational mind. Reflect on the source of your decisions. Many decisions are made at a subconscious level. Your journal will give you a chance to analyze these decisions rationally. Be ready to change decisions. Introspection will help you discover better approaches. When you do, be ready to change your initial decision. Observing Edison from his early years, one can see his work evolving from newspaper boy to telegraphist to inventor. Ultimately, as an inventor, Edison did something he was good at, loved, and got paid for — the ultimate combination. Build a long-term career. Edison’s first patent application was for a vote recorder that nobody ended up wanting, but he kept at it. Today, we remember him for his many later inventions, not his first unpopular one. Keep a journal so others can learn from your lessons. Thanks to Edison’s journals, we can see his entire process for success. Many of the real lessons about Edison’s work contradict what we’d rather believe. There was no overnight success or magical inspiration for Edison—it was just years of hard work. Attempting to emulate Edison and his successes by following his journaling habit was an ambitious goal. I mean, how could I emulate the journals of someone who is known as the greatest inventor to have ever lived — and who achieved more than I have by the time he was my age? By focusing on the fundamental lessons I shared above, however, I was able to make progress in my goals: writing this blog post, starting a company, and finding a rewarding career. And I’m much younger than 67, so hopefully this consistency will lead me somewhere great. What a fascinating person. Thanks for sharing these pearls of wisdom, Jawwad! that’s just awesome….Thomas Edison sure was a persevering genuis !! Thank you for your hard work ….learned a lot! !